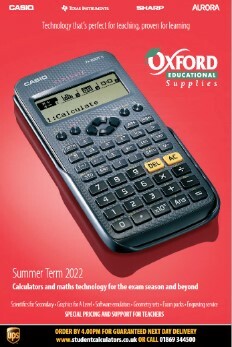 Oxford Educational Supplies - officially the largest distributor of both Casio and Texas Instruments calculators in the UK! Our Spring Term catalogue is hot off the press and features the launch of the brand new Casio fx83GT-X and fx85GTX scientific calculators, the direct replacements for the discontinued GT+ models with added new features. FX991EX is still available for next-day delivery and all new models are also available in Class Kits or Exam Packs. Call 01869 344500 for more details. Order anything online, school purchase order or by phone before 4pm for next-day UPS delivery. As always, we hold high levels of stock of all lines, so not only can you be sure of getting the right product at the right price, but if you order before 4pm weekdays, your order will leave us the very same day! If you liked our range of products and customer service, please tell your friends about us. The University of Oxford or Oxford University Press (OUP).